Unfortunately [or fortunately, depending upon your point of view], mother nature often does not operate on time scales harmonious with our temporal desires. The tropica/extra-tropical harmonization occurring right now would have been nice several weeks ago, but nonetheless, it imparts a glimmer a hope that a putative late-game save isn't entirely off the table. To be more specific, the GWO is in the most coherent/amplified state we have seen thus far this winter. P 6-7 propagation, bolstered by material increases in FT and MT contribution, adjunctively, with more momentum injected via the ewd propagation MJO signal into P8-1 [proxy of the -SOI as well] will tend to amplify the troposphere. The question is can we induce retrogression into a classical structure, NAO wise? Or will we see more of the same with extensions of the Azores high up into the high-latitudes? The answer to that is, "we'll see." As bad as this winter has been, mother nature likes to operate in ways antithetical to our desires. The "objective indicators" actually evince precisely the opposite of what one would like to see if one hopes for the induction of a zonal flow with early spring. This winter has been highly resistant to high-latitude amplification due to reasons expounded yesterday, though this will be the strongest pulse of tropical-extratropical harmonziation we've seen to date, with bonafide Nino-esque forcing. The pattern looks terrible to me the next 7 days for anything significant [maybe some front-end possibilities]. There's still glimmers given the above, from the last few days of February into March. The objective indicators suggest an amplified tropospheric pattern with PNA and NAO contribution, but persistence and the descending WLY QBO may still countervail. We'll see. Here in the UK and also across a large part of Europe, something truly extraordinary seems to be going on now and until further notice. Seeing that magnitude of 850 hPa temperature anomaly twice in the space of a week and three times in the space of 11 days is just staggering. The 500 mb height anomalies are also very impressive, especially later next week. All assuming the 12z ECM (with the 12z GFS similar but the 06z having been more so) that forms the basis for these charts is along the right lines - but the signal is proving very strong in the modelling now that the chance of some cross-polar ridging has largely been dropped (yet again this winter). Looking for the causes of this, well it's going to be an unusual combination and I have a theory that firstly, the propagating anomalies from the strong MJO passage across the tropical Pacific are being distorted by the negative AAM anomaly at 30*N (a Nina-like feature; as discussed by Tom in recent days) that as far as I'm aware continues to resist change even in the face of an extremely strong WWB across the Central Pacific (perhaps due to the anomalies from that being focused S of the equator as Snowy Hibbo proposed), and secondly, the lack of a strong lower stratospheric vortex (it's near the LTA which is a good deal lower than it is for Dec & Jan) is providing little in the way of zonal push on the blocking high, meaning that Atlantic troughs only serve to pump it up further via warm air advection aloft. 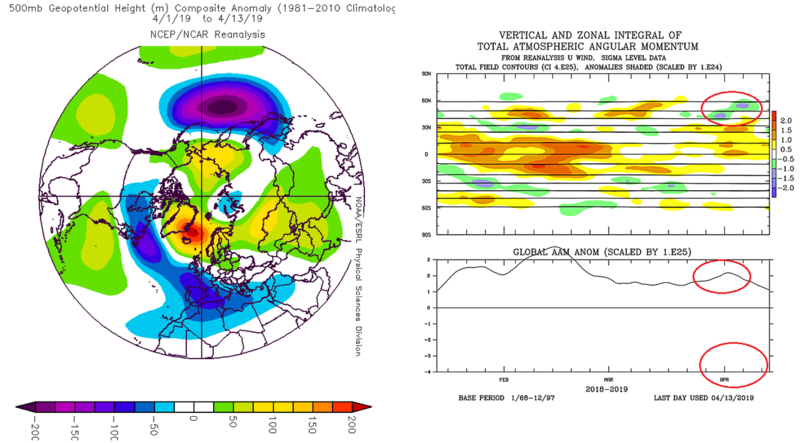 If it wasn't for the continued Nina-like interference, I expect the high-latitudes would be permitting the height rises needed to set up a powerful retrograding HLB from Scandinavia to Greenland, as is typical following MJO propagation through phases 7 & 8 with a Nino background (though given the weakness of the Nino we'd probably have seen the blocking head too far west for the UK (from a cold perspective) pretty soon - like what happened to start March last year, but probably less dramatic!). One factor I'm unsure of the role of is the QBO; does a westerly QBO at 40 mb and above have a direct ability to keep the AO more positive? I don't expect so based on what I currently know (it impacts the stratosphere's interactions with the troposphere, not the troposphere's interactions with itself) - but I could be missing some crucial information. I'm planning to read into this good and proper if and when I can make the time, but if anyone can provide a short answer to this particular question, that'd be greatly appreciated . I'd say it's fairly incontrovertible that the Pacific structure will be ameliorating, finally, as a function of the ewd propagation tropical convection and realignment of W/C forcing in more canonical orientation. Phase 8/1 entrance in a few days + 7-8 day lag, should elicit vicissitudes in the PNA domain by the end of February. The more intriguing and challenging inquiry for me, is can we get the NAO to play ball, at all? We have discussed this heretofore, and it's something @Snowy Hibbo noted I believe; namely, that much of the positive angular momentum has been concentrated in the southern hemisphere. Further, I noted that the equator-pole distribution of the angular momentum has been "wrong" and antithetical to the genesis of sub-tropical troughs, which accelerate jet flow and tend to initiate decelerating polar jets immediately to the north. Those conditions remain unpropitious through the next 7-10 days; however, if the CFS is correct, there may be a window within which a legitimate NAO *could* develop and actually retrograde a bit toward Greenland. This window of opportunity is approximately March 1/2-March 10th +/- a couple days. 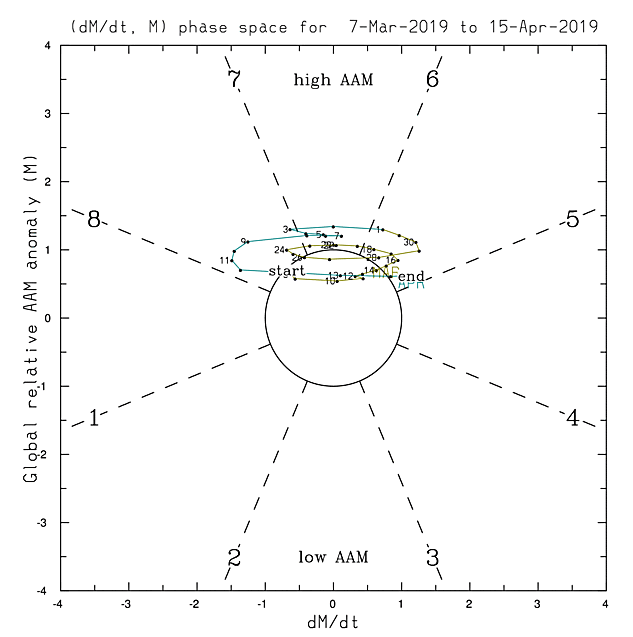 Besides the phase 1 lagged effects, forecasted equator-pole zonal winds are suggestive of an alteration from this winter's base state in the March 1-10th period by the CFS. Now, we continue to have persistence and descending wly QBO modulation countervailing, but if other variables rearrange, that shouldn't totally obviate the chance for at least a transient blocking feature. We'll have to monitor it, but I like what I see on the CFS zonal wind proggs in the first 10 days of March. Momentum diminutions in the SHEM, and reorientation of +AAM in more conducive places. We'll see. But, the Pacific alone will make things colder for the first half of March. 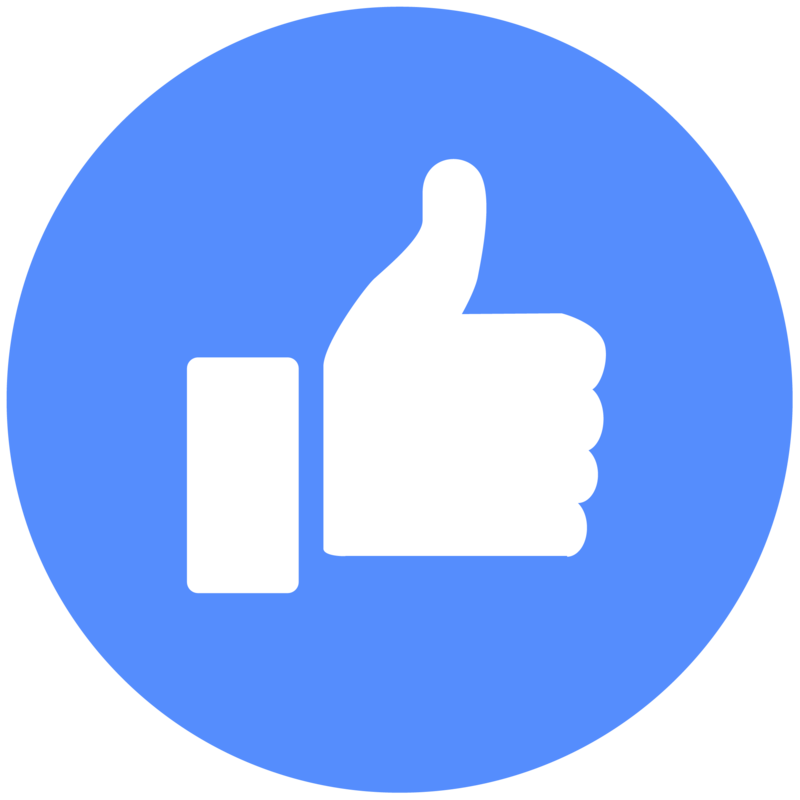 The question is, are we talking about a decent pattern (which would be much better than what we've had = ghastly, hideous, and diabolically impudent), or, could it be "better" than decent? That's contingent upon whether we can induce a transient blocking period. As said, there's a chance. But it also may not happen. Right, James. The tropical forcing and extratropical progression, i.e., MJO, GWO, etc., would certainly augment the argument for a retrogressive HLB feature. But the -AAM in the sub-tropics needs to decrease to permit it. It's not overally scientific in terms of gathering data, but in the next little while, there seems to be more purple (negative zonal winds), south of say 30S. These streaks of purple are in identifiable lines in the SHEM, that work in between the rossby waves, the cyclones and anti-cyclones. Then you have the well defined tropical setup with reduced/easterly winds in the IO, and more westerly winds in the Pacific. Then you have the negative zonal wind anomaly in the NP, caused by a number of highs in the region. But by and large the Polar jetstream looks rather strong North of 60N, and also within the Atlantic off the the Eastern US Coast. While there is plenty of things slowing down the pattern in the NHEM, there is not nearly as much there as in the SHEM, and it seems to be more erratic, in "clumps", rather than the stripes in the SHEM. Save for the low off Eastern South America (which has a corresponding stronger jetstream), the STR and low gradient is rather flat and remains so. Yet the lows are a bit further out from the poles at the moment, because we are in a -AAO pattern (notice the high right on the South Pole line). This is pushing things out, and has brought snow to the Australian continent in the past week or so. The polar lows are back in towards the South Pole, which should create a roaring jetstream, as they look to be making a flat gradient with few deviations with the STRHs. This means we should start to see westerly momentum added in the SHEM in March, which would correspondly show up on the total budgets. 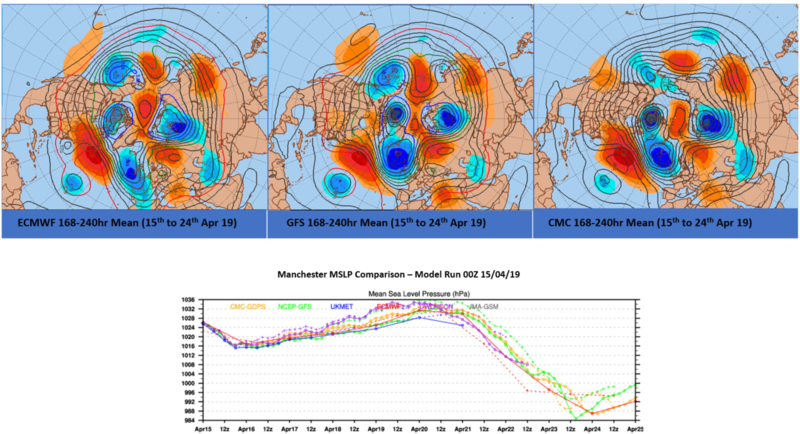 What seems to have been of particular interest here in the UK is how, finally, some more significant blocking patterns have materialized over the last 2 weeks, or essentially the first half of April even though the strat vortex has been in a particularly strong late-winter phase, so no help from there I would suggest and the MJO has been particularly 'quiet' too. March was, overall, noticeably cyclonic and wet, very wet for some areas of the UK, but this transition to blocking patterns at more northern latitudes is what was clearly hoped for during most of the winter. While we all know that the blocking regimes were there, at times, the lack of ability, if that's the right word, to set up at more northern latitudes was clearly a major failure, with the NAO in particular very reluctant to get -ve in any shape or form. 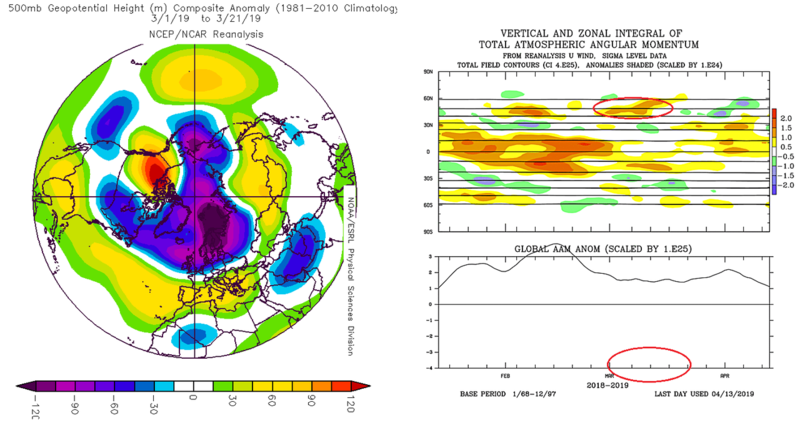 However, I would surmise that the -ve values of total AAM since late March and through into April above 40N initially and then above 50N is surely related to the large and dominant Scandinavian blocking pattern, with a very much reduced W'ly component to the atmosphere at these latitudes. Indeed, if this had been 2 or 3 months back then much of N Europe would have been in the freezer, it has been quite cold here in association with the block anyway, but clearly not to the same extremes that would have been possible back in the winter months. However, does that pattern now look set to change?...It does to me, there has clearly been a progression towards the tendency to fall more negatively in recent days, nearing the values of late February. Mountain torque has trended negative of late and while the GWO has been loitering in P5, 6, 7 and 8 it hasn't really been on the move or with any significant amplification. But could that be about to change, in association with this more pronounced trend away from such a strong blocking pattern across Scandinavia? There may well be someone out there who may be able to make a more distinct prediction of how the AAM may evolve over the next few weeks, perhaps drifting into phase 8, so more of neutral or even La Nina regime, but I would suggest that after the last 2 weeks of -ve anoms at 40, 50 and 60N, with a much reduced W'ly momentum, that pattern may well reverse with the more N Lats seeing an injection of W'ly momentum looking forward. As an addition to the above, find below a few extra graphics and plots. 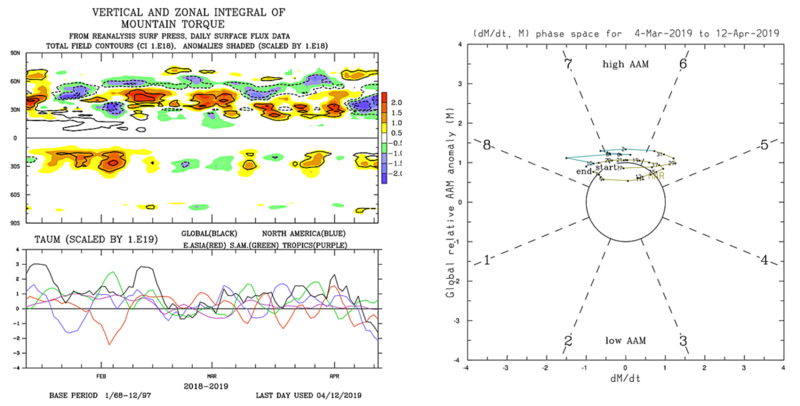 This seems to tie in nicely and is seemingly a good example of how the AAM and 500mb anoms can clearly be connected with regards to either +AAM through the mid-lats, say 40-60N, as what occurred during the first half of March or more. This N Hem pattern is clearly a distinctly +NAO regime too and, as I highlighted yesterday, brought a particularly unsettled and disturbed period of weather to the British Isles. The opposite has seemingly been occurring since early April mind, with -AAM through a similar latitude range, but clearly note the completely different N Hem pattern and especially so across the N Atlantic domain. This has, essentially meant that the first half of March compared with the first half of April, for the UK and NW Europe are completely opposite and this seems to be a superb example and connection to me. I think the main question of interest, which no doubt has a very complicated answer is; how can one predict the likely evolution of the AAM, whether +ve or -ve looking forward, especially so within than 40-60N latitude range?...As we found out this winter mind, this link isn't always clear cut and can vary, but still. Hi Matt, some good observations there and well constructed . True what you say regarding the AAM changes and increased westerly flow across the N Atlantic next week - but now, the falling phase is starting to look too brief for the Atlantic trough to push right across to the UK longitudes (thankfully, I’d you prefer it warm) before AAM cycles back around and the ridge builds back in. With the Pacific El Niño event underway, even though it’s weak, its reasonable to assume further positive AAM cycles going forward. The main uncertainty is the time spent in each phase, as the case for next week has shown. Got to rush off now - I’ll see if I can find time to expand on this later. 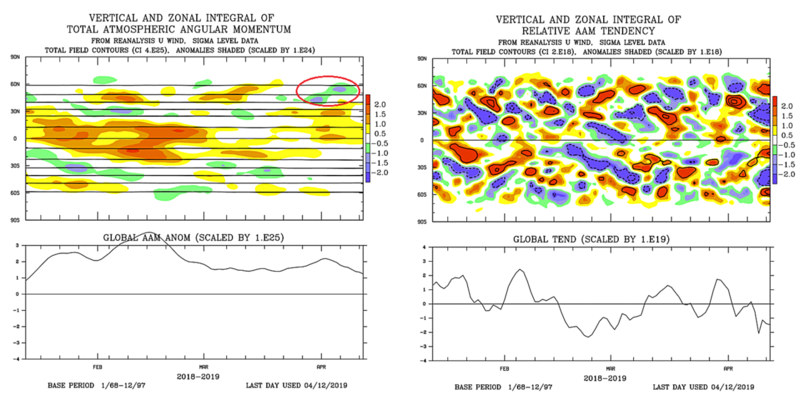 When you say "further positive AAM cycles" I presume you mean through the sub-tropical regions, as we have had over the last couple of weeks, so roughly 10N to 30N, as opposed to +ve AAM regimes like back in early March at more northern lats? If this is what you're implying then I can see how the -ve AAM regime may well continue then at more northern latitudes as per the last couple of weeks, meaning that further blocking episodes are likely. I would imagine with the breakdown of the strat vortex too over the next few days this will only reinforce the lack of any W'ly momentum at more northern latitudes; Clearly May is often the driest month of the year across the UK, on average, for a reason(s), this certainly being one each year no doubt.